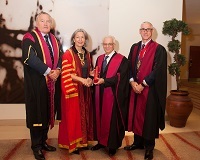 Pictured are (from left to right): Professor Stephen Cannon, vice president of the Royal College of Surgeons of England; Clare Marx, president of the Royal College of Surgeon of England; Dr. Foad Nahai; Nigel Mercer, deputy president of the British Association of Plastic Reconstructive and Aesthetic Surgeons. The American Association for Accreditation of Ambulatory Surgery Facilities (AAAASF) congratulates its immediate past president, Dr. Foad Nahai, for earning the Royal College of Surgeon’s highest honor, the Honorary Fellowship. The Royal College of Surgeons (RCS), is an independent professional body committed to promoting and advancing the highest standards of surgical care for patients, regulating surgery and dentistry, in England and Wales. Nahai was presented the award in London during a November meeting of the British Association of Plastic, Reconstructive and Aesthetic Surgeons (BAPRAS). In attendance were members of the councils of the RCS, BAPRAS, honored guests and colleagues. He is the Maurice Jurkiewicz Professor in the Division of Plastic Surgery at Emory University School of Medicine. He has published more than 212 peer reviewed papers, 47 book chapters and made 16 films. He has been the editor of the Aesthetic Surgery Journal since 2000. Besides serving AAAASF, Nahai also has served the American Society of Aesthetic Plastic Surgeons (ASAPS) and the International Society of Aesthetic Plastic Surgery (ISAPS). Current AAAASF President Dr. David Watts said, “Foad has been a significant figure in shaping the surgical industry throughout his career and has ensured that the voice of patient safety is represented on the world stage."